Book now your guided tour at the Acetaia! is the outcome of an old family Tradition. Sofia Malagoli after graduating from high school, decided to follow her father’s footsteps and study Civil Engineering at University of Bologna. Yet, after her first year of University, Sofia had the idea to turn Daniele’s hobby for DOP Traditional Balsamic Vinegar of Modena into a business. 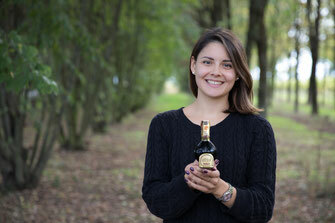 Thanks to her entrepreneurial spirit and the support of her parents, she started to promote their Acetaia and their DOP Traditional Balsamic Vinegar of Modena not only among family and friends. She started planning events at the acetaia, welcoming local and international tourists and building a solid sales network. Recently Sofia has established a business partnership with a company leader in the production of IGP Balsamic Vinegar of Modena; this way her Acetaia guarantees a wide range of products of the highest quality. Sofia's latest creation is represented by Sofia Luxury Chocolates, a new way to enjoy and discover the old tradition of her beloved Balsamic Vinegar of Modena. Last but not least, from the beginning Sofia tried to build up a strong network with local companies. She is convinced that to be successful you have to be part of a team and the stronger it is, the more it will accomplish! Learn more about her Food Experiences!